The Agency officially broke ground on a new office building on the southeast entrance of the SUNY Broome campus earlier today. The Agency was joined by state and local officials and partnering organizations including the Greater Binghamton Chamber of Commerce, the New York Business Development Corporation and Visions Federal Credit Union. 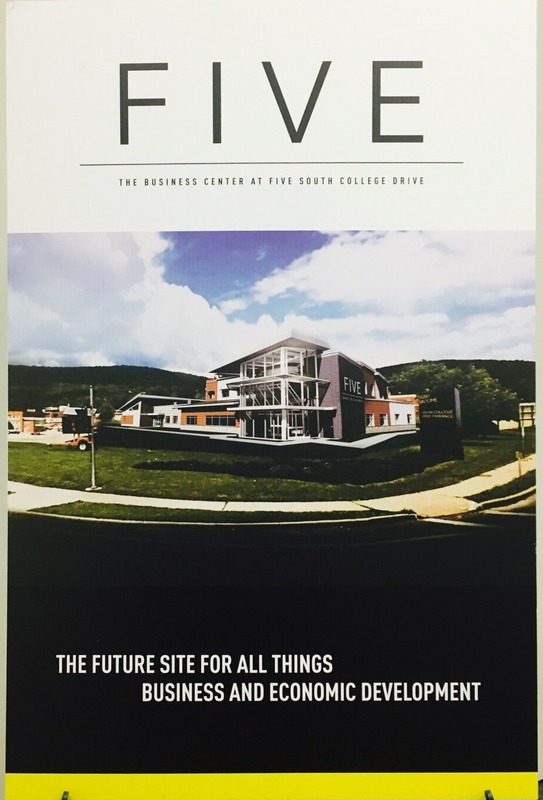 The Business Center at FIVE South College Drive is the first building to be constructed in Broome County for the purpose of collocating business and economic development organizations. This project is fully funded through a $4,350,000 New York Economic Development Assistance Program grant secured by the late Senator Tom Libous. The Agency will be the owner and anchor tenant of the new building that will also house the Alliance for Manufacturing & Technology, the Greater Binghamton Chamber of Commerce, Visions Federal Credit Union and the local offices of the National Development Council and the New York Business Development Corporation. The Agency has also included space to relocate its small business incubator, currently located in downtown Binghamton. Discussion on a “one-stop” facility is not new to Broome County and in the past, there have been many attempts to create a single location for economic and business development in Broome County, but none have gone so far as to construct a brick and mortar facility. Agency representatives feel that this proximity is necessary for partnerships and collaboration. "We’re thrilled to partner with The Agency on its one-stop economic development center for Broome County, right here on our campus,” said Kevin Drumm, president of SUNY Broome Community College. “This makes it the first of its kind in New York at a community college and one of the few in the nation to be located on a community college campus. But it's a natural fit for the college, as all community colleges are essential to the economic development of their regions. The center will provide great opportunities for our students, our faculty, area employers and industry and Broome County’s workforce as a whole. It’s a win for everyone." State and local leaders were on hand to celebrate the groundbreaking and stress the importance of having a central location to drive economic and business development opportunity. “I would like to thank The Agency for all of the hard work they have put into the planning and building preparation for The Business Center,” said Senator Fred Akshar. “Making it easier for our local businesses to pursue the opportunities and assistance available to them will help speed up our economic recovery efforts overall." “The Town of Dickinson is proud to be the Host Community to The Agency and we look forward to working with this very important organization as well as with the Greater Binghamton Chamber of Commerce, Visions Credit Union, and Alliance for Manufacturing & Technology and all of the tenants in the building,” said Mike Marinaccio, supervisor of the Town of Dickinson. The Business Center at FIVE South College Drive is approximately 17,500 square feet and will include two stories. It will be will be located at the southeast corner of the SUNY Broome Campus at the corner of Front St. and Lt. VanWinkle Drive. The building was designed by Delta Engineers and Fahs Construction will serve as the Construction Manager. Construction will begin on October 18. The Agency anticipates the building will be open in the summer of 2017.